Which Little Golden Books have you read? Which one is your favorite? Do you prefer books with stories that feature pop culture figures or those that only use original characters? Why? According to the article, children's books written before 1942 were big, ornate, expensive books that were sold exclusively in bookstores. Little Golden Books were cheaper, more kid-friendly, and sold in places where anyone could grab one and go. What impact do you think this had on the literacy rate of young children? Why? 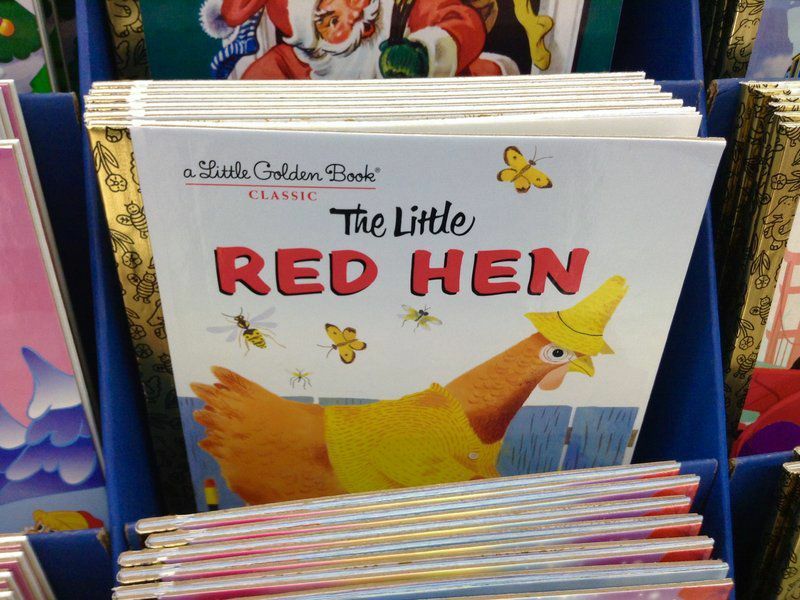 According to the article, Little Golden Books has taken steps to address its racial and gender biases over the years. What impact, if any, do you think these changes have had on the young children who read the books? Why? Prior to conducting this activity, collect a variety of Little Golden Books for students to view. Have students select and read a Little Golden Book. As they read, instruct students to look for information in the text or illustrations that "dates" the book, or shows that it was written for or during a certain time period. Have students brainstorm ideas about how they could update the book for today's audience. Then give them time to rewrite the book. As an added challenge, encourage them to also update the illustrations. Create a Venn Diagram. Have students compare and contrast the original book to the revision, as outlined in the customized grade-level lessons below. Challenge students to identify key differences in the story and illustrations. As a class, select one Little Golden Book. Read the book as a class. Then brainstorm ideas about how it could be updated for today's audience. Divide the class in half. Instruct each half to update the story and illustrations as they best see fit. Create Venn Diagrams to compare the two versions to each other as well as to the original text. As a class, select two Little Golden Books. Then divide the class in half. Assign one book to each group. Instruct groups to read their books and brainstorm ideas about how the books and illustrations could be updated for today's audience. Then give groups time to rewrite their stories and draw new, modern illustrations for the book. Use Venn Diagrams to compare each revision to the original version of the story. Divide the class into groups of four. Have each group select one Little Golden Book. Then have the groups split into pairs. Instruct partners to read their books and brainstorm ideas about how the books and illustrations could be updated for today's audience. Then give partners time to rewrite their stories and draw at least two new, modern illustrations for the book. Once all pairs are finished, have groups reunite. Instruct them to use Venn Diagrams to compare their rewrites to each other and to the original story. Provide multiple copies of a select number of Little Golden Books. Divide the class into pairs. Have partners select one Little Golden Book. Instruct them to read the book and brainstorm ideas about how the text and illustrations could be updated for today's audience. Then give them time to rewrite their stories and draw at least two new, modern illustrations for the book. Once all pairs are finished, instruct pairs that rewrote the same book to join together. Tell them to use Venn Diagrams to compare and contrast how each team updated the book. Post the completed diagrams. As a class, identify the most common revisions students made to the Little Golden Books. From "The Poky Little Puppy" to "Doctor Dan the Bandage Man," the Little Golden Books have been a childhood staple since 1942. Take a trip back in time and explore some of earlier books in the series with this National Museum of American History exhibition. Symbols in a Story: What’s What? Invite students to explore this interactive, in which players go deep inside the painting “Achelous and Hercules,” by American regionalist Thomas Hart Benton. The artist set the Greek myth in rural Missouri, giving it a new figurative meaning. The activity introduces the literary devices of symbol, simile and metaphor. Read this Smithsonian article to learn all about the tales of a bride and her animal groom, which have circulated orally for centuries in Africa, Europe, India and Central Asia. In this lesson from the Cooper-Hewitt, Smithsonian Design Museum, high school students will read a Japanese folktale, “Momotaro: Boy of the Peach,” to learn about Japanese culture and story structure. They will then create a children’s book version of the Momotaro story to share with younger readers. In the fall of 1881, Alice Fletcher traveled to Dakota Territory to live with Sioux women and study their way of life. Visit this site, created by the National Museum of Natural History, to read the journals she kept and the Sioux folktales she recorded during her stay. Broaden your students’ minds with these cultural educational guides, lesson plans, media programs and other useful materials from the Smithsonian Center for Folklife and Cultural Heritage.